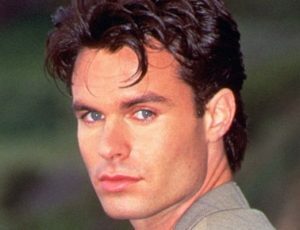 The versatile persona, Patrick Muldoon III is a well-known actor of "Days Of Our Lives"(1992-1995) (2011-2012). He is also recognized as a lead singer and guitarist of the "The Sleeping Masses." In his early childhood, painting, singing, and writing were his hobby. Furthermore, he also had a keen interest in sports and athletes. He played football for USC Trojans team and was the member of Sigma Chi fraternity while he was in college. He attended Loyola High School and graduated from the University of Southern California in 1991. During the late 1980s, Muldoon posed for the “Men of USC” calendar and prompted him to begin modeling through Wilhemina Modeling Agency. After that, he appeared as a television actor in "Who's the boss"? and "Saved by the Bell" in 1990 and 1991 respectively. His natural acting ability was identified from the role he portrayed in "Days Of Our Lives" as Austin Reed from 1992 to 1995. He was again cast in the same series from 2011 to 2012. He became much popular from the primetime soap opera "Melrose Place"(1995-1996) as villain Richard Hart. Later, he starred in "Chain of Command" (2000) as Michael Connelly, "Project Viper" (2002) as Mike Connors and "Boyfriend for Christmas (2004) as Ryan Hughes. Muldoon also appeared in the music video "Waiting for Superman" as Suicidal Man in 2013. Moreover, he starred in television movie like "Deadly Revenge" as Jack in 2014; "Patient Killer" as Derek in 2015 and "His Secret Past" as Charles in 2016. Recently, in 2017, he was cast in the series in "Boyfriend Killer" as Charles Durro. His first movie was Rage and Honor II, where he appeared as Tommy Andrews in 1993. He is best known for his roles in the 1997's "Starship Troopers" as Zander Barcalow and 2007's "Ice Spiders" as Dan "Dash" Dashiell. Following, he appeared in various critically acclaimed movies such as "Broken Angel"(2008) as Kevin; Noah's Ark : The New Beginning as Shem (voice role) in 2009; "Repo" as Jeffrey Maiser in 2010; "Spiders 3D" as Jason Cole in 2013; and "Little Dead Rotting Hood" as Deputy Henry in 2016. He is now an accomplished actor, and his upcoming project is "Take Two For Faith," which will be released in 2017; He will play Seth Ingram. Patrick is also an established musician, who served in a rock band "The Sleeping Masses" as lead singer and guitarist. He is writer and singer of the title song in "Powder Blue" in 2009 with Jessica Biel. In 2010, their music video "The Woman is the way" was released with an association with Ocean Fall Agency. Patrick has no any record of marriage and child. But, according to various sources, he was in a relationship with many women. We can be sure about his affair with many girlfriends starting from his early career. He was firstly linked with Tori Spelling, an American Actress in 1995. The couple shared romantic moments together for one year. Tori Spelling is now married to Charlie Shahnaian and a mother of five children. After Tori, Muldoon dated Stacy Sanches in 1996, an American Model and was in the limelight until 1998. After having two years of affair, they separated. The reason behind their separation is unknown. Nonetheless, Patrick didn't stop here. He again fell in love with an actress, Denise Richards. They were spotted together in romantic date several times. But, Patrick has never admitted his relationship with Denise. From 2002 to 2006, his girlfriend was a French actress, Juliette Binoche. The duo stays in long term relationship, but again, she was unable to become his destination. They ended their relationship in 2006. There was also rumor of him for being in a relationship with famous American actress, Eve Mauro for one year from 2008 till 2009. Patrick Muldoon is active in the entertainment industry since long. He is a famous actor of the soap opera "Days Of Our Lives" and popular as a lead singer of the band "Sleeping Masses" from which he gained bulk amount along with name and fame. People (USA) magazine's 50 most beautiful people in the world (1996), is ranked among richest celebrity and considered as highest paid actor. He has done various successful movies through which he has maintained his high-class status in the Hollywood industry. Hence, Patrick Muldoon's estimated net worth is $1.5 million.